It was my brother who introduced me to the world of wine and started my interest. When I finished High School I was actually heading off to go and study Veterinary Science, but I was working on a wine farm in the Constantia Valley to earn a bit of money. After two years of study and working on this farm I decided to make the change to study viticulture and oenology. 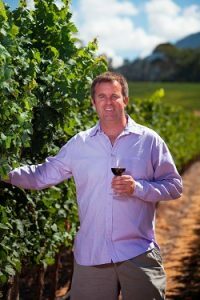 When I was finishing up at University I started working for Rustenberg wines in Stellenbosch. This was where I got really involved in the cellar activities and the day to day running of a cellar. In 2004 I headed off to Bordeaux and worked at Château de Fieuzal so I could learn different techniques and see different soils and climatic conditions, this was a period of tremendous education for myself. In 2005 I went to Alsace and worked at Cave Dietrich to see and work with grape varieties which I had no prior experience with, such as Pinot Noir, Gewürztraminer and Riesling. In 2006 I worked at one of Napa Valley’s Icon wineries called Screaming Eagle, this was a real experience to see the absolute fastidious work which went into the vineyard and it was the first time I had seen hand destemming of grapes take place on a large scale. There was a lot to be learnt with their soil types and climate which I could relate to back in South Africa. In 2007 I headed back to Bordeaux to work with one of the true stars of Bordeaux, Hubert de Boüard at Chateau Angelus. I learnt an incredible amount from Hubert and his wonderful team. Their dedication and attention to detail in both vineyard and cellar was amazing. At the end of 2007 I started work at Glenelly Estate in Stellenbosch which is owned by the Bordeaux legend May de Lencquesaing. What attracted me to work here was the opportunity to work with her and to be able to establish a new and exciting brand. I think there is one word which is vital in both wine and viticulture and that is Balance. I believe in letting the varieties express themselves and letting them tell the story of the vintage. I try and let everything happen as naturally and organically as possible. Cabernet Sauvignon, you have to get everything exactly right for it to express its true beauty. I find that it also gives you the true essence of the terroir where it has been planted and if made well it is a wine which will age beautifully and reward you for waiting. There is still a bright future for wine, but as a sector we must look at other industries to make sure that we can be dynamic and move with the changes which will inevitably take place. The market will be bigger, but there will be less reliance on the older markets such as Europe and far more will be happening in the Asian markets and North American markets.